Welcome to Morningside RV Estates, the premier RV resort and retirement community in Dade City, FL! We are a full-service, high quality extended stay luxury RV park for residents 55+, and we are located near many exciting attractions in Zephyrhills – Dade City. Our RV Park gated community is close to US 301 and Lakeland Highway just about nine miles from I-75, offering easy access to all surrounding areas of Zephyrhills and Dade City. We offer both basic and premium RV Park sites, all of which are roughly 2,160 square feet. We provide our tenants with a neighborhood-like environment and the feeling of living in a community. We always have activities for the active retiree, such as numerous clubs and classes, sports, movie nights, bingo, bike riding, shuffleboard, horseshoes, aquatics, quilting club, carving club, and even Glee Club performances and holiday dinners. Our beautifully landscaped and well-maintained property also features many exceptional amenities, such as a heated enclosed pool, shuffleboard courts, billiards, laundry rooms, a fitness area, library, and much more. We offer daily, weekly, monthly, and seasonal RV Park rental rates, and park model homes at this Zephyrhills 55+ community. In addition to everything we have to do here onsite, there are also numerous restaurants, theaters, attractions and exciting happenings in and around Dade City, Zephyrhills, Tampa, and Pasco County. We are also just a short drive from some of the best beaches the Sunshine State has to offer. 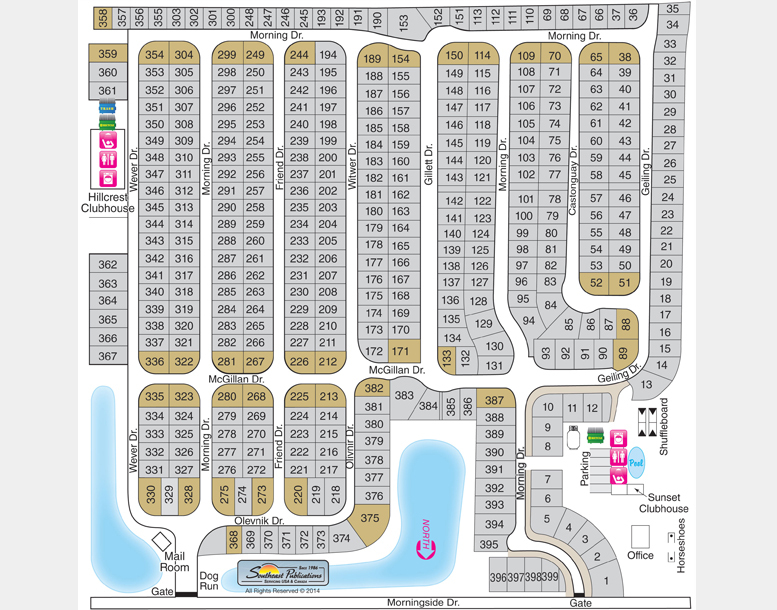 RV Parks in Florida have never been this good! The following Rules & Regulations are for all guests of Morningside RV Estates to preserve the park’s facilities and to ensure a pleasant living environment. We ask each guest to comply with these rules and regulations in order to create a compatible community in which we can all be proud. Morningside RV Estates prominent location allows for easy access to many outings and adventures, but we also provide a wide array of amenities and activities to keep the fun going right on the campgrounds. We are a family friendly campground with a lot of fun activities and events.